Choosing the right friction solution needn’t be a challenge. Be it for truck, trailer, bus or coach, Textar offers disc brake pads and drum brake linings for 100% of all European commercial vehicles. And with Textar, every product comes with the assurance of total quality, maximum safety and ultimate reliability. As the world’s leading brand for commercial vehicle brake friction and the leading supplier of brake pads and linings to both the O.E. sector and the aftermarket, Textar offers the performance and safety that only the original can guarantee. That’s why 70% of all commercial vehicles in Europe are fitted with Textar brake linings as standard. 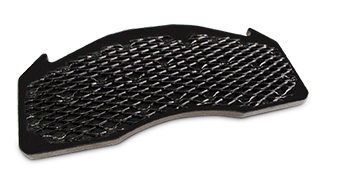 Driving innovation: Textar’s new lightweight disc brake pads combine safety with sustainability. Their ultra-strong, yet lightweight design contributes to lowering fuel consumption and emissions, so they’re better for you and for the environment too. DELIVERING ON THE HIGHEST EXPECTATIONS. With patented bonding technologies and advanced production methods approved for the O.E. sector, the Textar product range is unique in the international aftermarket. Textar friction products for commercial vehicles are a perfect combination of superior braking performance, long service life and low disc and drum wear. This first-class quality can be found across the entire range of more than 600 disc brake pads and drum brake linings for commercial vehicles. At TMD Friction we work in partnership with vehicle, axle and brake system manufacturers to develop application specific friction solutions. It’s our knowledge and expertise that’s behind the braking technology and friction fitted to a vast range of commercial vehicles, trailers, buses and coaches as they roll off production lines. For example, T090, our market leading material for drum brakes, was developed in partnership with BPW specifically for their axles. Likewise T0100 was developed specifically for SAF. In both cases, Textar remains the exclusive O.E. supplier for these trailer applications. So it’s no wonder that both the axle manufacturer’s logo and the Textar logo are to be found on the aftermarket replacement part. Our material T7400 for disc brakes continues to be the top O.E. choice for buses, not least because of its unrivalled wear characteristics. The Textar range includes not only high quality brake pads, discs and linings, but also a comprehensive range of wear indicators and accessories. With the addition of the new lightweight brake pads for commercial vehicles that pave the way for the future with efficient and environmentally-friendly brake solutions, Textar is offering a full product range to meet the highest demands. WE GO TO THE LIMIT. guarantee permanent bonding of the friction material to the backing plate. In other words: optimum safety and comfort. LESS IS SOMETIMES SIGNIFICANTLY MORE. Lighter vehicle components help to reduce vehicle weight – which in turn leads to fuel savings and lower CO2 emissions. TMD Friction is the trailblazer in this sector and Textar brake pads manufactured with the new lightweight backing plate from TMD Friction’s Lightweight Technology Program are lighter than conventional commercial vehicle brake pads whithout compromising safety. The advantage for fleet operators: Textar’s lightweight brake pads utilize the same geometry as standard brake pads, so they’re a direct replacement fit. 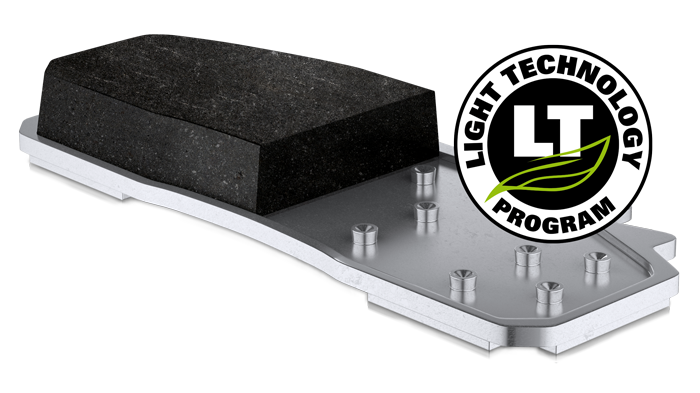 Making this simple change to lightweight brake pads can contribute to an overall reduction in vehicle weight and an improvement in fuel consumption that can realise noticeable fuel savings over the service life of a commercial vehicle. Use our online calculator to see the potential savings for your fleet. YOUR PERSONAL ONLINE CATALOGUE AND MARKETING SERVICE. Because the braking of a vehicle requires far more energy than its acceleration, brake pads and linings in commercial vehicles are continually exposed to high stresses. Example: With an engine power of 340 kW, a 40 t truck can accelerate to 80 km/h in 45 seconds. In contrast, full emergency braking from 80 to 0 km/h in 3 seconds requires a braking power of 3,300 kW. An unbelievably high stress factor for the rather small friction component. Compromises in terms of quality can quickly become very expensive.